Over recent years it’s become more and more popular. Fashioning a rustic, country feel to your dining space suits all kinds of homes and styles of decor, and often means you don’t have to be too precious about matching or co-ordinating your furniture and accessories. There are lots of points and elements you can consider in creating a look like this. To give your look authenticity shop around for antique chairs from a reputable site, and reputable dealers. Your table may be old wood, inherited, passed down from your relatives or picked up at a flea market. Alternatively, you might like to mix the old with the new. 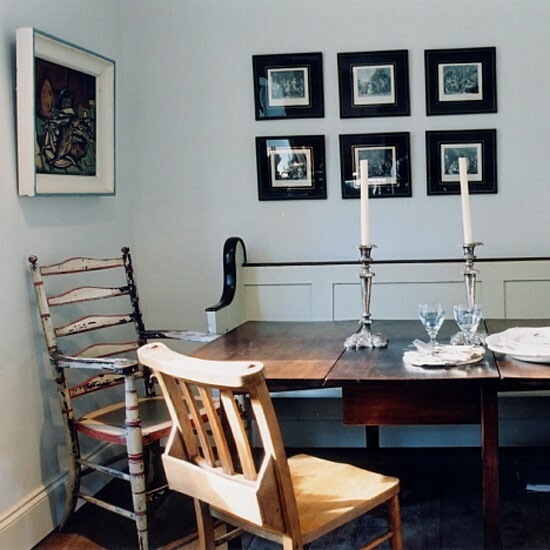 Your eclectic mix of antique chairs could look stunning with a modern, brand new dining table. Purchasing one in a darker or rustic wood will suit the look best, and the more dents and knocks the better. White walls and lots of exposed wood is a great backdrop for this look, and some kind of display furniture like a dresser is perfect too. Old metal accessories, candlesticks and a striking chandelier will help bring the look to life, adding warmth and depth plus a sense of occasion. As in the picture below, hang the chandelier above the table and chairs for maximum impact. Exposed wooden flooring, if you have it, will help recreate the country feel in the room, but add rugs to break up the expanse and to inject flashes of colour throughout the area. Natural, rich colours work best and offset the dark woods and imposing atmosphere from the furniture. Give a rustic dining area a modern twist and add bursts of copper; a trend still popular this season. The lush metallic hue is in sharp contrast to the rustic woods and works brilliantly well as lighting over the wooden table. This is farmhouse chic brought bang up to date! In short, lots of texture, natural materials and colours and wood or stone flooring produces a country or rustic look that many of us would adore in our kitchens or dining space. It’s a look that works well in both older and more modern homes, and will stand the test of time with grace. Would you like to recreate this look in your home? What key ingredient would you add to make this look work well? Me too! I’d love a set of mismatched chairs too. Now I’m just wondering how to find an old church pew. So envious of pics like this. Its my dream to have a large farmhouse/rustic style kitchen/diner. 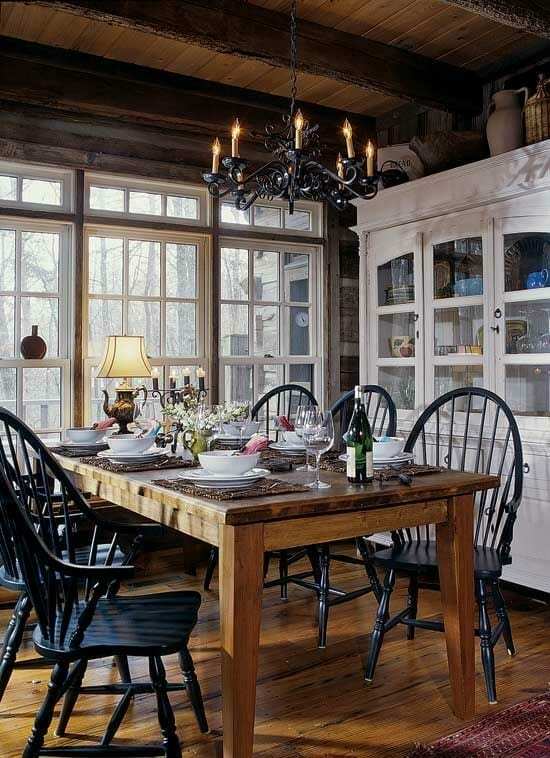 I’d love a really big rustic style dining set so all the family can sit round together. I often sway towards white/neutral coloured walls as its a perfect blank canvas to build on and in rustic rooms like above it prevents the room looking too dark. Exposed wood beams, stone/wood floors and rugs creates add such beautiful layers and textures resulting in such a warm, stylish and inviting room, adding a chandelier just completes the scene, pulling the design together with a central feature. I’ve always been one for matching, but I am liking the mis-match chair look, it adds real character. Maybe one day eh! The Second picture, black Windsor style chairs, where can I buy them from please?